In the wake of the Bolshevik Revolution, while Dziga Vertov was still in his early 20s, the ambitious, idealistic young artist started working for a state newsreel company, first as an editor, then a cameraman. He helped launch a documentary series, “Kino-Pravda,” which began as a kind of cinematic magazine reporting on the glories of communism, but then became more abstract. Vertov got away with this because he was fervently revolutionary, and fluent in the movement’s rhetoric. He made the argument that the culture of the Soviet Union should be as cutting-edge as its political and economic systems, which to him meant pioneering new modes of expression that weren’t beholden to conventional, authoritarian, “corrupting” fiction storytelling. Vertov’s theorizing and hustle resulted in 1929’s The Man With The Movie Camera, a startlingly innovative film that screened all over the world in the decade before World War II and the Iron Curtain isolated the Soviet movie industry. Man With The Movie Camera’s opening title-card boasts that the film was made with no script, and contains no dialogue—not even silent-movie inter-titles—because it’s aiming to develop an “international absolute language.” Following up on the way his colleague Sergei Eisenstein experimented with montage, Vertov and his wife/editor Elizaveta Svilova cut together images sometimes due to their thematic connections, but just as often because they liked the emotional effect of the juxtapositions. Although the film has a premise of sorts—it’s about the work of a cinematographer, played by Vertov’s brother Mikhail Kaufman, who also shot most of the footage—the true purpose was just to capture scenes of daily life, as naturally as possible, and then to use editing and music to transform their meaning. 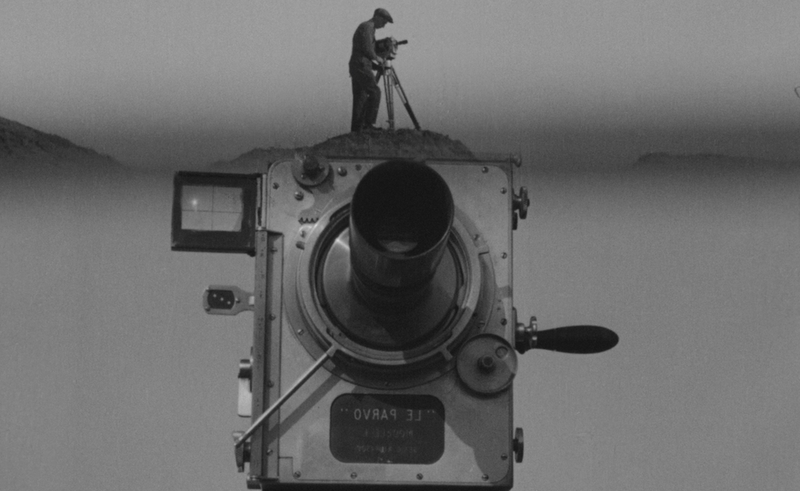 In its original run, Man With The Movie Camera was exhibited with live musical accompaniment, often following Vertov’s notes for what he wanted the soundtrack to be. In the home-video era, several different scores have been released with the film, but the best known is the 1995 recording by Alloy Orchestra, which mixes sound effects and electronics into a propulsive, jazzy composition that otherwise sounds era-appropriate. The Alloy Orchestra music—included on Flicker Alley’s new Blu-ray edition of Man With The Movie Camera—doesn’t distract from the images, but enhances their impact. The film would be exciting to watch even completely silent, both because it’s a valuable record of Soviet city life at the end of the 1920s, and because it explodes with visual ideas. Vertov and his collaborators tried out stop-motion animation, double exposures, split-screens, irises, and a pace that can only be described as “breakneck.” But the heavily percussive music also helps get the heart pumping. The Flicker Alley Man With The Movie Camera Blu-ray features Lobster Films’ 2014 2K restoration, sourced from a full-frame print believed to be be the only complete existing complete version. (Because the film was widely circulated, then trimmed to suit local standards and tastes, a lot of previous VHS, DVD, and repertory prints are missing seconds or even minutes of footage.) Of even greater interest to cinephiles who’ve seen Vertov’s masterpiece multiple times, the Flicker Alley set includes three more of his features: 1924’s Kino-Eye, which applies some early examples of Vertov’s formal play to a report from a small farming village; 1931’s Enthusiasm: The Symphony Of The Donbass, which attempts to do with sound what the previous year’s film did with pictures; and 1934’s Three Songs About Lenin, which takes stock of communism a decade after the first Soviet Premier’s death, finding more cause for hope than reasons for concern. Each of these films has elements and sequences that are as striking as the best of Man With The Movie Camera. In Kino-Eye, Vertov periodically reverses the film, drawing attention both to the artificiality of cinema and to the root-processes of the cattle-ranching and bread-baking that city-dwelling Soviets take for granted. Three Songs About Lenin takes the accomplishments of collectivism and focuses on how they’ve ennobled individuals, while also subtly sounding a note of alarm over the Soviet Union’s increasing militarization. But the most fascinating of this bunch is Enthusiasm, which is primarily a document of a factory working to meet its five-year quotas a year early, but is more valuable for its attempts to cut together ambient sound and snippets of narration into something halfway between avant-garde music and soothing white noise. None of the bonus movies on this Blu-ray are as thrilling as the main feature, though. Maybe that’s because they follow more conventional editing rhythms, or perhaps it’s because they’re fundamentally programmatic, meaning to make a specific point about life in the Soviet Union in the wake of the revolution. The Man With The Movie Camera isn’t devoid of messages, but most of it seems as improvisatory as Vertov insisted in his opening title-card. The film is like a compendium of what one attentive young photographer might get distracted by in the course of a single day: a woman getting dressed, well-toned athletes playing games, the bodies of beachgoers, the action of an ambulance racing to a rescue, the rush of a freight train, the awesome scale of a hydroelectric dam, and the skill and diligence of people at work. It’s no accident either that Vertov includes cameramen and film editors in his celebration of human industriousness. That was all part of his mission to demystify processes, expose illusions, and express his sincere belief that packing boxes on an assembly line could be as beautiful and valuable as creating a timeless work of art. In addition to the four features above, Flicker Alley’s Blu-ray adds one of Vertov’s Kino-Pravda newsreels, which looked back at the death of Lenin and used animation and superimpositions to recreate the mood of the country as its leader’s end was imminent.